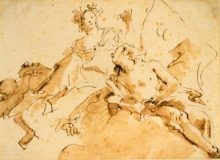 Rembrandt and his pupils are known to have made life drawings of naked male models in about 1646. The model here was possibly his young student Willem Drost. He appears in a number of studio drawings by various hands, in which he is seen from slightly different angles. 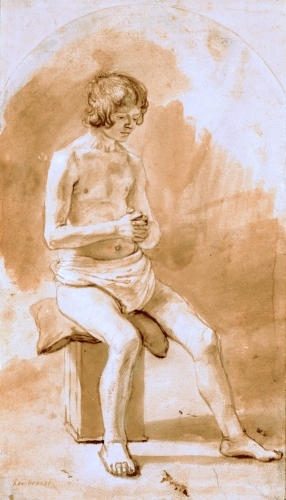 This example may be by Samuel van Hoogstraten, who would later complain about the ungainly posture of Rembrandt’s life models: ‘I regret that we in our youth were given such meagre instruction therein; for there is no more work in copying a graceful pose than an unpleasant and disgusting one’.